In Totenart we have the full range of Paper Canson Infinity Edition Etching Rag for digital printing. Infinity Edition Etching Rag, 310 gr., A4, box 25 sh. Infinity Edition Etching Rag, 310 gr., A3, box 25 sh. Infinity Edition Etching Rag, 310 gr., Roll 0,61x3,05 mts. Infinity Edition Etching Rag, 310 gr., A3+, box 25 sh. 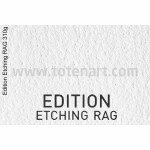 Infinity Edition Etching Rag, 310 gr., A2, box 25 sh. Infinity Edition Etching Rag, 310 gr., Roll 0,432x15,24 mts. Infinity Edition Etching Rag, 310 gr., Roll 0,61x15,24 mts. Infinity Edition Etching Rag, 310 gr., Roll 0,914x15,24 mts. Infinity Edition Etching Rag, 310 gr., Roll 1,118x15,24 mts.